2015 is a year of observance of the 100th Anniversary of the Armenian Genocide. It is also a year of celebration of the 70th Anniversary of the Consecration of St. James Armenian Church. It will be a year full of community events and services. 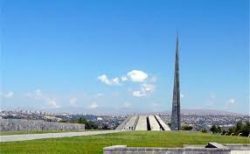 You might be aware of THE 100 YEARS, 100 FACTS online project that educates and raises awareness about Armenian history and culture as a way to communicate the 100th Anniversary of the Armenian Genocide. This week we are launching our own THE 70 YEARS, 70 FACTS project with some well-known as lesser known facts about St. James Armenian Church and it’s parishioners. Starting this week and continuing through the entire 2015 “The 70 Years, 70 Facts Project” will publish facts once a week in the E-Bulletin and Sunday Bulletin, as well as on Facebook and Twitter. 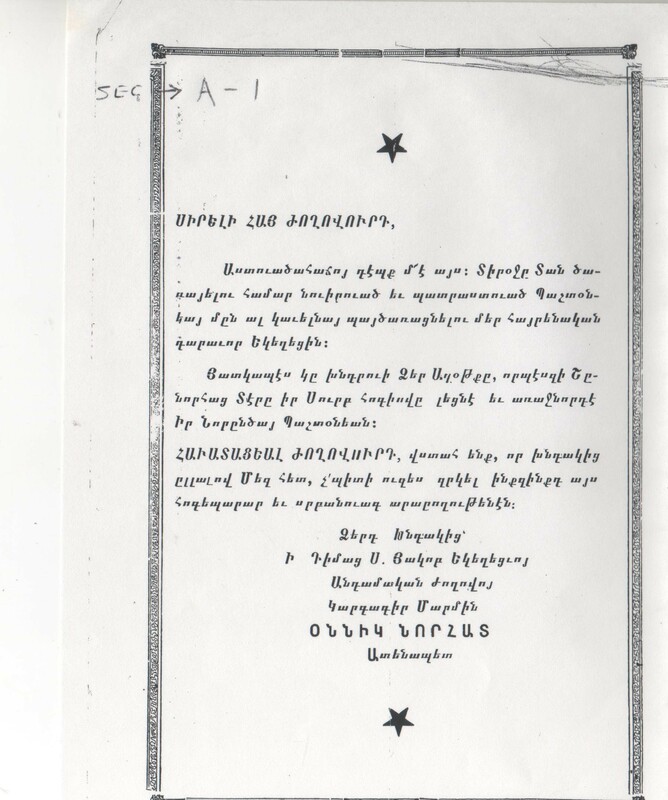 The number of facts will grow until the 70th and final fact of this collection is published on April 24th, 2015, to mark the centennial of the Armenian Genocide. FACT 1 Our building is 120 years old. The sanctuary of St. James Armenian Church was built in 1895 for the Norwegian-Danish congregation. The Armenian community purchased the building in February 1944 from Our Savior’s Methodist congregation. The original name of the Church was North Shore Armenian Apostolic church. 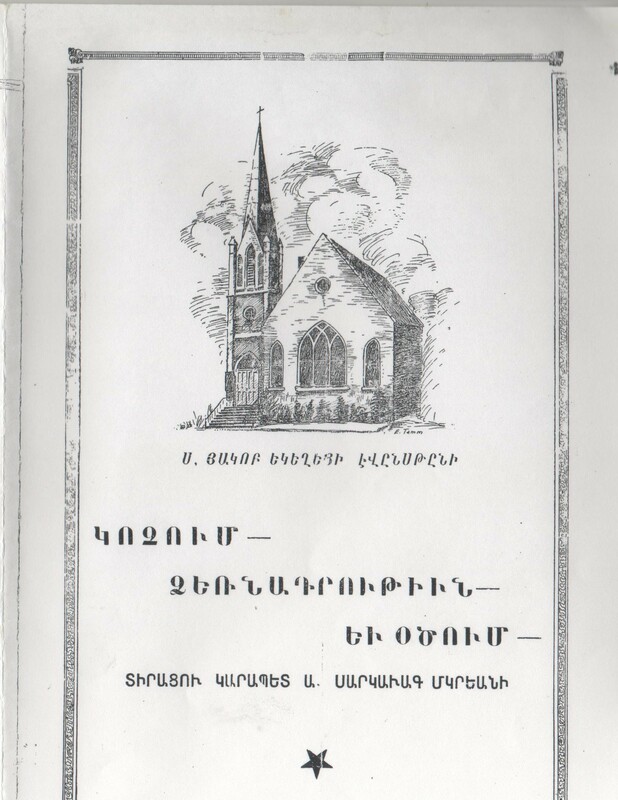 The Church was consecrated on February 26, 1945 by Bishop Tiran Nersoyan (then Dzayragooyn Vartabed) and named St. James, in memory of the late father of Walter Vartan, the gunkahayr (godfather) of the new church. FACT 2 The first pastor of the St. James Church was the Rev. Fr. Vartan Megherian. He was still an archdeacon when he arrived from the St. James Convent in Jerusalem. After completing his theological studies at the Seabury-Western Seminary, he was ordained a priest, on February 28 and 29, 1948, in solemn and impressive ceremonies in St. Luke Episcopal Church, by Bishop Tiran Nerosyan and Bishop Sion Manoogian, in the presence of many Armenian church dignitaries. Rev. Fr. Vartan Megherian served at St. James from 1947 to 1954. Click here to see more pictures: Picture 1, Picture 2, Picture 3. FACT 3 The building of the community hall was a twelve -year dream of the members of the St. James Church. FACT 4 In 1954 St. James Parish hosted the delegates of the Eastern Orthodox churches attending the Second Assembly of the World Council of Churches, as well as a dozen or more Armenian clergymen, headed by Archbishop Tiran Nersoyan, who had come as observers to the historic gathering which was held in Evanston between August 15 and 31. FACT 5 The ACYOA (Armenian Church Youth Organization of America) Chapter of St. James was established (organized) in 1947. The first officers were: Wally Sarkisian (President), Mary Kaylegian (Vice-President), Lucy Kurnalian (Vice-President), and Alice Omartian (Secretary). In 1949 the St. James Chapter had 26 active members. In 1050 St. James Parish hosted the ACYOA Fourth Annual Assembly. Click here to see more pictures. FACT 6 Catholicos of All Armenians Vazken I visited St. James Armenian Church during his historic visit to the United States in 1960. FACT 7 By reason of its ARCHITECTURAL SIGNIFICANCE the building of the St. James Armenian Church was declared an EVANSTON LANDMARK. FACT 8 St. James parishioner Dr. Sam Mikaelian served as Superintendent of Wilmette School District (District 39) for six years (1992-1998). District 39’s administration building was officially renamed the Mikaelian Education Center by the Board of Education in recognition of his 31 years of service to the District. FACT 9 The original name of our was Church North Shore Armenian Apostolic Church of Cook County, IL. FACT 10 Very Rev. Fr. Varujan Kabarajian pastored the faithful of St. James for 45 years (1958- 2003). Fr. Varujan served as a visiting pastor to several churches in Chicago and southern Wisconsin. From 1973 to 1977 he was the only Armenian clergy in Illinois. On January 1, 1998 the Evanston Police Department assigned him as a police chaplain. He was honored by the Evanston City Hall for his services to the city. FACT 11 St. James Armenian Church is a founding member of Family Promise Northshore, and one of twenty-one churches and synagogues that have partnered to support families in the community that are facing homelessness. Family Promise is dedicated to helping families who are homeless or at risk of becoming homeless get back on their feet and provide a stable lifestyle for their children. FACT 12 The centuries-old relic of St. James of Nisibis-comprised of bone fragments of St. James and encased in a beautiful, metal reliquary, shaped in the form of a human hand with fingers poised in benediction-had traveled more than 5,000 miles from the St. Kevork Armenian Church in Plovdiv, Bulgaria, to St. James Armenian Church for veneration on our Name Day in December 2014. FACT 13 Due to the scarcity of Armenian clergymen, the diocesan office was unable to provide a pastor for the newly established St. James parish from 1054 to 1958. 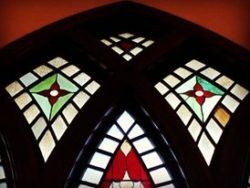 To the credit of the St. James congregation, the doors of the church remained open throughout that crucial period, thanks to visiting clergymen and especially to the services of the late Deacon Hovagim Fundukian and late Archdeacon Nishan Cherkezian and the devout members of the congregation. FACT 14 Two pastors of St. James Armenian Church, Rev. Fr. Hovhan Khoja-Eynatyan (2010- present) and Rev. Dn. 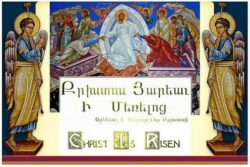 Levon Kirakosyan (2005- 2010), are graduates of St. Nersess Armenian Seminary in New Rochelle, NY, the only Armenian Seminary in the Western hemisphere.